A resource for those who collect George R. Stewart books, or books by other authors. Antiques Road Show often shares good tips for collectors. One such tip, broadcast about a year ago, led to a lover of books who has set up a small company that produces and sells reproductions of classic book covers. It’s a wonderful way to protect your historic bound books. You can easily get to the main page of the site from the Earth Abides/ GRS section. Some collectors have mixed feelings about using such reproduction covers, fearing that they might be used as forgeries, or because of copyright concerns. But the scholar who runs the company is careful to note on each cover that it is a facsimile, so these covers cannot be used as forgeries; and none of these covers have been produced or used for several decades — the books have been updated with new covers several times — so there will be no loss of income to publisher or author or agent through the use of these older covers for your old books. Mark Terry, the artist/scholar who is keeping these beautiful covers alive, has many more covers than the 9,000 on the site — 40,000 now — so if you’re interested, send a request through his site. 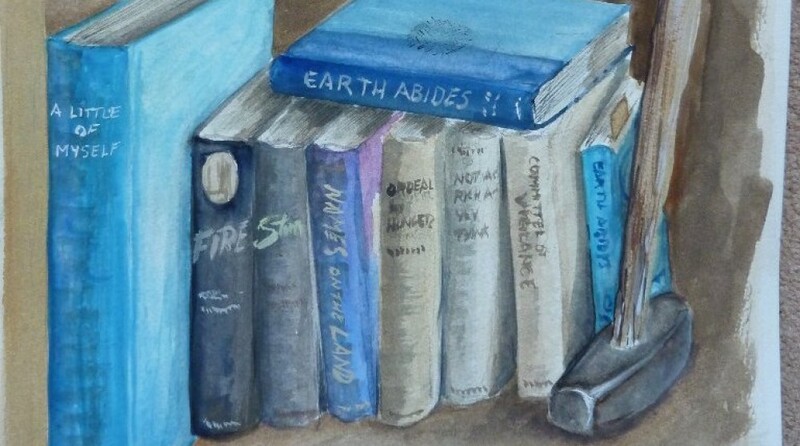 Even if you have an original cover — and I’m luck to have two for my first editions/first printings of Earth Abides — a facsimile cover is a good way to protect those valuable books. The obituary gives a fine overview of Jack’s remarkable career. He was the pre-eminent geologist for much of the land that John Wesley Powell first surveyed in the nineteenth century. Powell later established the United States Geological Survey, where Jack worked for his entire professional career. Sadly, the obit does not mention the work he did on his father’s books — designing a faux national forest for Fire, then mapping it; doing photography for US 40; and helping with field research at “Sheep Rock.” A modest man, Jack did not publicize these contributions to literature. But it is important to share this part of his distinguished legacy. It is also important to note that, like his father and mother, Jack chose public service over a potentially lucrative private career. In doing so, Jack, like many of his and my generation, modeled an excellent example of working virtuously for the public good. At the moving conclusion of Earth Abides, Ish hands his Hammer to Jack. In the same way, when George R. Stewart died, he left the Hammer of Ish to his son, Jack. That symbolic act shows the importance of our friend and colleague, Jack Stewart. If you’d like to read the book, don’t use Kindle, and don’t want to pay the price for the printed version, you can now order it for Android. The price is the same as the Kindle price, $19 and change. Like the Kindle version, this version can also be read on a PC. Bob Pavlik has just sent a copy of his review of the GRS Biography. With his kind permission, I’ll post it here. Bob recently won the California State Governor’s Award for Historic Preservation, a well-deserved honoring of his long career in preserving the history of this place. The times, trials, travels and accomplishment of George R. Stewart (1895-1980) are well documented in this engaging biography, written by a longtime student and admirer of the former UC Berkeley English professor. Stewart was a Pennsylvania native whose family was acquainted with another writer and California emigrant, the poet Robinson Jeffers. Stewart grew up in southern California but went east for his education, earning his A.B. degree at Princeton in 1917 before joining the U.S. Army. Following a medical discharge he enrolled at UC Berkeley for his M.A. (his thesis was about another writer and traveler, Robert Louis Stevenson), before finishing his studies at Columbia University. Stewart took a break for a 3,181 mile bike trip through the United Kingdom and Europe; he was a peripatetic who would later put his rambles to work in several well regarded books. Following his graduation with a Ph.D. from Columbia, Stewart took a job at the University of Michigan, where he met his future wife, Theodosia (also known as “Ted”). In 1923 he moved to Berkeley (and witnessed the great fire of September 1923), where he assumed a professorship that would last for 39 years. The couple was married the following year in Ann Arbor, and had two children, Jack and Jill, who were raised in the Berkeley Hills as well as in a writer’s cabin in the Sierra Nevada, and on the road while their father conducted his research for his many books. The more you learn about George R. Stewart, the greater your admiration will grow. You’ll also learn something about the biographer (Don Scott), and you’ll admire him, too, for his persistence as well as his enthusiasm. Scott was a California State Park Ranger at Thornton State Beach in Daly City (south of San Francisco) where he got to know the Stewarts in the 1970s, and where a trail was dedicated to the prolific author and Professor Emeritus, who died in August 1980. Wallace Stegner considered the naming of this trail as one of the highest honors Stewart received during his lifetime. Another honor, albeit posthumous, is this fine biography. Robert C. Pavlik is the author of Norman Clyde: Legendary Mountaineer of California’s Sierra Nevada (Heyday Books and the Yosemite Association, 2008) and a Thornton State Beach alumnus. Frank Brusca is a leading “odologist” — a student of historic highways. He has written about them in American Road magazine. His research is also the subject of several chapters in William Least Heat Moon’s latest book, Roads to Quoz. Frank is working on a rephotography project for George R. Stewart’s classic U.S. 40 — the first book to explore the geography of a nation using one of its major highways. Stewart’s book relies heavily on photographs taken at representative locations along the old highway. His book was followed by Vale and Vale’s U.S. 40 Today, in which the Vales followed George Stewart’s route and photographed the same sites 30 years later. Frank is working on another re-photography of the Stewart sites. Jack Stewart passed away today. Jack once said that it was hard to be the son of George R. Stewart. He felt overpowered by his father’s ability to research and write works that helped define the twentieth century by popularizing the ecological view of human affairs decades before anyone else did so. Yet Jack was as accomplished in the same general field, if in a more focused way: Jack was THE USGS “Man” for Nevada. He produced the USGS map of Nevada, and wrote the book that accompanied it. Jack also helped his father with the research and photography for Fire, US 40 and Sheep Rock; so he is also an unsung hero in the work of George R. Stewart. The incident which most shows how George R. Stewart felt about Jack is in the great classic, Earth Abides. At the moving conclusion of the novel (which was dedicated to Jill), Ish, the human hero passes his hammer – symbol of power and leadership – to his descendant Jack. There was a real hammer. Jack inherited it. So, in the real world as well as George R. Stewart’s world-changing book, Jack became the keeper of the Hammer of Ish. One of my goals in writing the GRS biography was to produce a book that Jack would feel did justice to his father, and the family. He did get to see and read the book, enjoyed it, and bought copies to share with friends. That is perhaps my greatest satisfaction from the entire project. If you are so inclined, and find a moment to do so, please send some positive thoughts toward Jack, and his family.